As a florist and business owner you know the importance of marketing. Your florist eCommerce website is no different. Your florist website is your online storefront and silent salesperson. You run specials on flowers you need to move, there are holidays considered florist holidays (Valentine’s and Mother’s day, among others) and you need the tools that make it easy to let your customers, both in store and online, know about your sales. We create several florist holiday related banners that you can select through SiteWorks, which are then automatically activated on your website. Most of these are for the major seasons, big holidays and a few others. We can also place a custom banner on your website to advertise an open house, a clearance event or a special workshop you are holding at your brick and mortar location. You can submit the graphic to us via the Media99 HelpDesk, or you can request that a custom banner be made. For custom requests we require a few days notice before you expect to see the banner on your florist eCommerce website, primarily because we have to create the graphic which takes time, and prefer to send you a preview before we place the graphic on the internet for all to see. Part of the included services in the Media99 Florist eCommerce package is access to our email campaign marketing system. This service is similar to other email marketing services you may pay for from a third party. 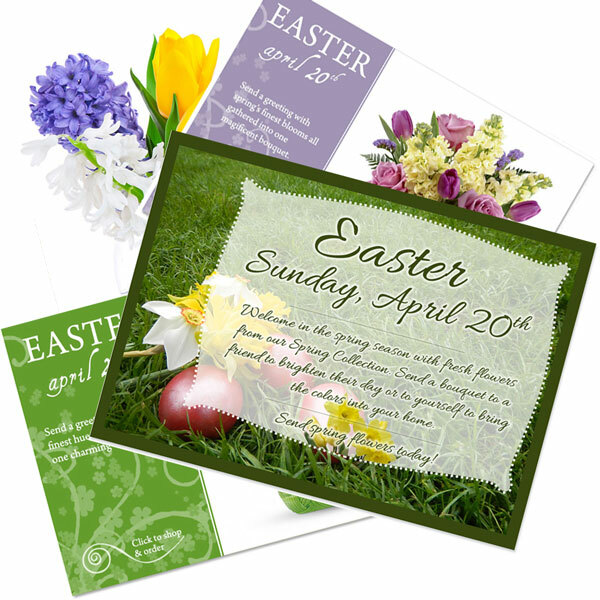 We create mailers to be sent on specific holidays such as Boss’s Day, Administrative Professionals Week, Christmas, Thanksgiving and many others. You get to choose from the selection of email marketing campaigns in SiteWorks and submit the mailer request with the click of a few buttons. Once we receive the request we put together your mailer and send you a confirmation with a link so you can view the finished product. We then send the mailer to the customer email list you have provided us on the date you request. You can also request custom mailers, which we create for you based on your requests. You can run a special on mums or poinsettias send out an email to your customers letting them know these flowers are on sale. We do require a few days advance notice on custom mailers because, like banners, we have to create the advertisement. We believe that you, the florist, should have a say as to when holidays appear on your florist website. It is your virtual flower showroom. After the holidays have passed it is standard practice for our website technicians to remove the floral occasion from your website categories, making it one less thing for you to have to remember. We also have a program, called the Automatic Holiday Update (AHU) Program, in which we automatically enable particular holidays on your eCommerce website, this way when those busy florist holidays arrive and you are in the design room sweating away trying to fill all of your orders to get them on the delivery truck, we take care of listing the holiday on your florist website. All other holidays you wish to list are requested through our free HelpDesk. The AHU Program is available free of charge. We don’t require anyone to use this program, but most florists find it very useful during those busy times when they forget about activating a category on their website. The dates for the listing of each holiday are listed in our web-based maintenance software, SiteWorks, so you have a list of dates to reference and to make sure your categories are merchandised and ready to go live by those dates. The rest is up to the people on this side of the computer.